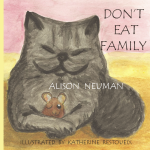 When I wrote my first children’s book, Don’t Eat Family, I knew it was going to be a three book series. Well that was the plan to be determined by the response from the first book. 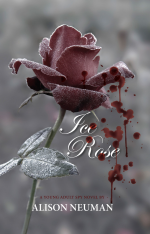 The response was favourable with several adult readers suggesting that I write another. Last year the journey of Help from Friends started with the spark of an idea. I am very lucky to have an editor who tells me like it is. With her feedback, I was able to clean up the manuscript and make changes that my illustrator could enjoy creating. When writing a novel, it is about the story and the pictures it creates for the readers, but for my children’s book, it is also about the written images the illustrator can use. In my mind, I tried to select interesting places and items that could be illustrated. Then it was up to the illustrator. With the text submitted, I wondered what would be chosen as the images. All this time the characters and places and I shared somewhat of a long distance relationship. While I had a sense of their particularities, the exact tangible reality was still somewhat of a mystery. When the illustrator shared the proofs of all the pages, the text had finally found the missing pieces of the puzzle. The places and characters that lived in my mind, were now on the page. This was the first time I was introduced to what four new characters looked like. Her process of taking text and creating images, places, and characters is an art that I am in awe of. My children’s book is just flat one-dimensional text, but with the illustrations, the characters are two dimensional and live in a world as bright as every reader’s imagination. Come and join us to celebrate the launch of Help From Friends. Join us as we celebrate the launch of Fluffy and Levi’s continuing journey in the new children’s book, Help From Friends. 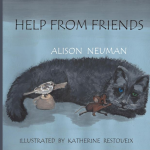 You can meet author Alison Neuman and illustrator Katherine Restoueix, create your own stickers of characters from the book, and decorate and eat your own book-themed cookie. The Sunset Syndrome — Emily watched her husband of 60 years fight a battle with dementia and its related complications. A few years after his passing, she too is diagnosed with dementia. As Emily struggles with difficult decisions about her future, she reflects on important moments from her past. While watching the news one evening, I was inspired by a story about a dementia patient who chose to take her own life rather than lose herself and be a burden. I wondered how a person would set out to justify – or not justify – such a decision. This was my spark for my play. I struggled with my play ending and whether my character would take her own life or choose time. If you want to know her choice, you will have to come and see The Sunset Syndrome. After being mentored from February to July 2015 through the Alberta Playwrights Network’s RBC Emerging Artists Mentorship Program and Conni Massing, I was left with time to sort issues such as who was the main character was talking to, what were the pertinent details of dementia and their place in Emily’s journey, and how could I enhance the love story between Emily and Samuel and the sometimes messy dynamics of family. 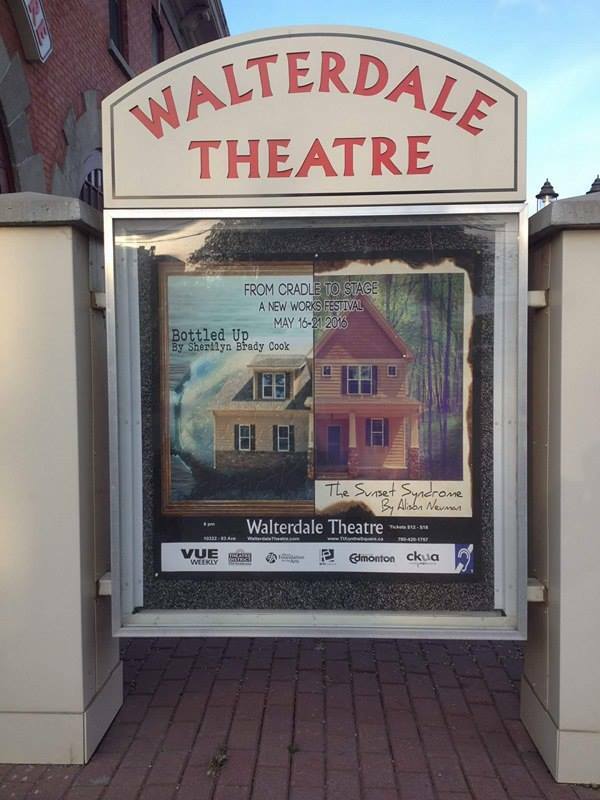 With a focus on the art and community opportunities, The Walterdale Theatre From Cradle to Stage New Works Festival was my choice as a home for my play. Sherilyn Brady Cook’s play, Bottled Up, had been accepted as well. We had not met prior, but both of us shared the festival journey. My 8-month journey began with an amazing group from the Walterdale Theatre and Edmonton Theatre Community. The day I met the Festival Coordinator Vlady and my dramaturgs, Brian Dooley and Rohan Kulkarni, I was a mix of excitement and nerves. The Sunset Syndrome is only my second play, and I felt there was so much I still needed to learn. I met and exchanged emails with Brain and Rohan to address how the characters, messaging, and story were presented and my intentions for each. Each time I was able to focus on finding meaning and messaging that could be better visited and transitioned. Then, in December, a first read was arranged at the theatre with a group of actors and I met my play’s director, Catherine Wenschlag. Having the actors read from the play was powerful and pointed out areas that required polishing. There was also chances to borrow ideas from the actors in how they played the characters and how the dialogue flowed. It also provided an opportunity to see which scenes were emotionally and visually connecting and which were not. Watching Catherine’s process also taught me about directing and how she saw the play, actors, and staging. Each reading and discussion provided a chance to focus on the content that was the strongest and cut the content that was frivolous. In each rehearsal, I was able to see what information the actors required to build the characters and watch their skills and talents take each character from one dimensional to three dimensional. The From Cradle to Stage New Works Festival nurtures the playwrights and their process. I was able to be at the auditions, a reading, and every rehearsal that I wanted to attend. Monday night I attended some of the Cue to Cue for The Sunset Syndrome to see how the lighting cues are set up. When we pulled up at the theatre, the festival poster was in the marquee and there was my name on the poster! While all along this process it has felt real, it seemed so much more official to see it in the Marquee. It took so much energy to stop myself from letting out a squeal! The Walterdale Theatre From Cradle to Stage New Works Festival opens on Monday May 16th, 2016. Performances of The Sunset Syndrome and Bottled Up run every night, May 16-21, 2016, at 8pm and alternate first and second positions. Thanks to the following special people for making The Sunset Syndrome possible: The Walterdale Theatre Team, Anne Marie Szucs, Vlady Peychoff, Brian Dooley, Rohan Kulkarni, Catherine Wenschlag, Rebecca Bissonnette, Kevin Heaman, Peg Young, Andy Northrup, Roseanna Sargent, Shelby Colling, Grace Chapman, Patrick Maloney, Richard Hatfield, Joan Hawkins, Geri Dittrich, Alan Weston, Tom Lam, Louise Mallory, Cale Walde, Janine Hodder, Glenna Schowalter, Emilia Eyo, Athena Gordon, and Kristen Finlay. Most writers have a project they have written that is sitting in a computer or a drawer just collecting dust. Myself, I have two fiction manuscripts and two screenplays that I am very aware are still around. All are full length. The pieces range from being written as far back as sixteen years ago to as recent as 2010. 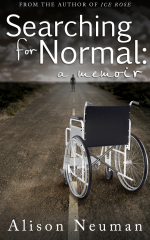 One novel is a story about a woman who loses her memory and the lengths the people in her life will go to in order to get her missing memories and a mysterious item she has hidden. The other novel is about an investigator who goes undercover to protect a former boyfriend and his child from a situation in which he is in the middle. One screenplay is about a researcher who travels to Brazil to find the answers to mysterious deaths in the monkey population and finds himself kidnapped and tortured by his past. The other screenplay is about a death investigation team and an eager crime reporter who becomes part of the story she is researching. All are plots and themes which still, to this day, interest me. That said, new ideas pop in my head and they seem to have an urgency over the previous material. After all, the material is written and I know the ending. The new material and characters have yet to be discovered. With each project I write, my skills grow. As they grow, when I open previous projects, each error is obvious. As I look at my previous projects, it becomes evident the amount of energy that will be required to bring each project to the final state. For each previous project it is a test to my interest and energy as to whether it will be dusted off and worked on. Every person has an activity he or she loves. An activity that the person just ‘gets.’ For some it is flying or cooking or painting or chess. I love writing and dancing. In 2014 I was privileged to dance in several pieces as well as emerge as a choreographer. As with any dancer, my health affects my ability to dance and I recently had to take ten months off of dancing. I felt a disconnect between my brain and my limbs. What it was desperately trying to get my limbs to do was different than the actual actions that were the end result. I struggled as each movement, large or small, caused pain in arthritic my joints. However, in this time I had a wonderful opportunity to be a choreographic assistant. For five months I watched another choreographer’s process from the infancy stage to the final performance. As the choreographer explored the movements and the story of the dance, I was learning about how effective abstracts were. Learning use of the stage. Learning to help each dancer grow. Learning costuming. Learning. The dancers were the same who I had been lucky to dance with for the last five years. I’m not going to lie, as the months progressed, I missed dancing. I missed being able to escape the body barriers I experience. While this may sound strange, when I dance seated in my wheelchair I’m able-bodied. Yes, my arthritic fingers are permanently bent, but when I dance they extend. My joints that arthritis has deformed are no longer deformed. Dancing is about my ability. I kept reminding myself that not dancing was not permanent. The months as a choreographic assistant taught me the art of choreography and still allowed me to be part of the dance community. Deep inside I was missing movement. Missing dancing. My confidence as a dancer was low. As the months and my health progressed, a concept for a dance tip-toed around in my head. Wanting to bring the idea to life, I contacted another dancer in our community to see if she would be interested in working on a duet. She agreed. I booked studio time. I had the song. I was ready to step into dance once again. The first rehearsal was amazing. Together we played with movements. We played with the meaning of the piece. We played with sound. It was like being a child in a candy store. On the drive home, I was filled with an energy and a happiness that had been missing. The next day my joints reminded me of my limitations, but my soul reminded me of the freedom and love for dance that had been missing. For eight weeks, the other dancer and I met weekly to work through each phrase until we were able to string them together into a story. At the end of the process, I found my confidence and a gentle reminder what was missing in my life. Dance. A gentle reminder we need these activities and passions in our lives, even when they are challenging. Every year I tell myself that this Christmas is going to be the year I’m going to invest time and put some effort into making a present for the special people on my list. Prior years I have failed, been unable to create something that would be suitable. My Mom used to knit, but due to the arthritis in my fingers, shoulders and neck, I have not been able to follow in her footsteps. 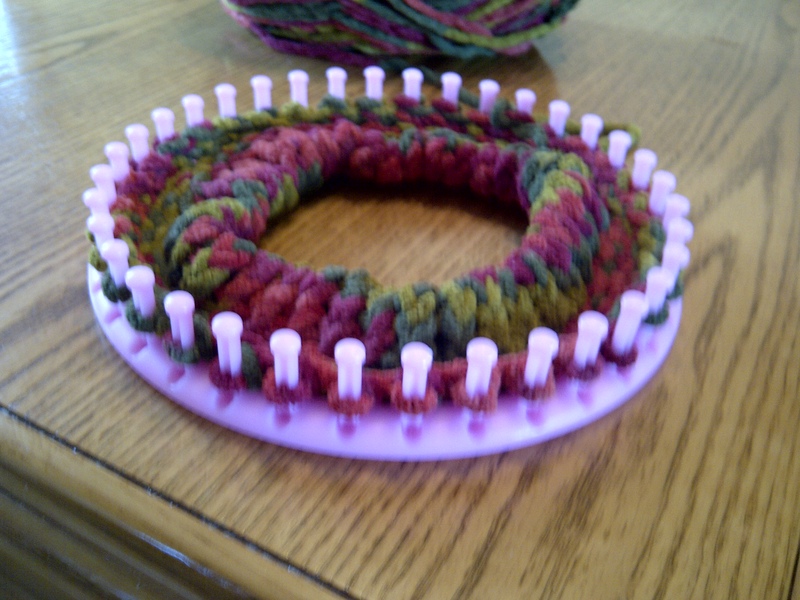 Then, while shopping in the craft aisle of a local chain store, I spotted a round loom. I used a tiny one when I was a child, but these were people versus doll-sized. My Aunt spends months knitting hats, which she donates to the city’s disadvantaged. She came over one day and was knitting hats on the loom. One hat took her a few hours. It sparked my interest wondering if the loom could help me to achieve my goal and overcome my arthritic joints. Living in Canada, our winters can be long and cold. A nice hat would be perfect for most of the persons on my gift list. So at the end of July, I decided to start my holiday gift-making quest. Instead of using standard yarn, I purchased a large skein of Bernat Blanket yarn. It is soft, colorful and extra thick. This meant I only had to wind each peg with one string yarn instead of two. I found a video to show me how to start and I was on my way. While I can only loom knit for a half hour a day due to my joints, energy and pain levels, I was able to knit a hat in roughly a week. As the hat grew, I must admit that I was unsure as to how to get it off the loom once I was finished. Again I referred to a video, which gave instructions to tie off the end row. 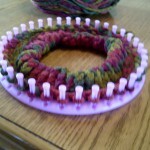 With the large skein of yarn I purchased I will be able to make several economical gift hats. And each person who receives a hat has something that I made with my own two hands, something not sold by the hundred in stores. Each person who receives a hat will receive a gift of my time. No matter what the length of the project in front of me, at some point toward the end of the project, I always wonder, am I done yet? Novels require so many drafts. Once the writer has the story completed, there are themes, characters, plot, dialogue, and the grammar, layout, and overall readability to consider. I’m not sure if a writer ever feels as if the project is finished. After all, he or she has spent minutes, hours, days, weeks, months or years working on a piece, and have toiled to get it to the best it can be. When writing a novel, I enlist readers to provide a manuscript evaluation. This provides me an opportunity to see the material from a reader’s point of view. It allows my writing to speak for itself without all the background information of which I am aware. Readers’ opinions allow me to know if the amount of information is too much or not enough. Readers’ opinions provide a view of what should be added and cut out. Subsequent drafts can weed out some of the areas that raise red flags or take the readers out of the world of the story. A world in which I want them immersed. A world where they are not spending too much time analysing and trying to figure something out. Then there is phrasing and wording. There is nothing as powerful as being able to string together just the right words to create a phrase, a sentence, a paragraph, a page. For myself, this process can be never-ending. It can be a challenge to find that right arrangement, that elusive ‘perfect’ word. My useful trick is to read the project backwards. From backwards I mean the last sentence, then the next sentence. As the sentences are not in order and are essentially standing on their own, they have lives all to themselves. My judgement as to the point of knowing if my project is complete is when I do the addition test. Is there anything that I can still add to the project? If all the points have been checked, reworked, drafted, and explored, then this ‘baby’ I have been working on is ready to go out into the world. Posted in Writing	| Comments Off on Are you done yet? So a writer gets an idea in his or her head and the long journey starts. I must admit I find the process an adrenaline rush and yet daunting at the same time. With an idea, there must be enough content to not just fill those pages, but also to provide readers with a book they want to finish. For my first published novel, I just jumped in and figured out timing, characters, and the story as I went along. Comments from the readers have been ‘we didn’t know what was coming next.’ The characters led my story and the readers were along the ride. That said, I ended up having to do multiple rewrites and movements of entire sections of the book. While this was part of the editing process, I wondered if I would be able to keep that same wonder for the writer and the reader but still be able to have some kind of outline to follow and cut down on editing. An outline that would lay out all the important details, plot, characters, and themes. That is a terrible outcome for a new novel, so I went on a search to find some advice on a way to organize my writing, while still allowing me the freedom to create and let myself write. Lit Reactor had eight methods to try. My two favorites methods, which I plan to try, are ‘The Skeletal Outline’ and ‘Free Writing.’ I feel those will provide me the framework of an overview of the journey my story and characters will take, but will allow me the flexibility to let the story develop naturally. I struggle to put words in a new pretty book. The pages are so clean and full of potential. Will what stains the pages be poetic, beautiful? Will it tell a story of love or adventure, or both? The possibilities paralyze my pen, for it can also be awful. A waste. Musings of a want-to-be wordsmith, someone turning the new, pretty book into something ordinary. The thought makes me sad to an illogical degree. The new book offers a means for expression and creativity. To be able to express myself is something I crave and have craved since I was in elementary school. I see the world around me in words, letters of the alphabet pushing and shoving to line up in the order that best describes that event, this feeling, those people, or any inspiration. So give me a cocktail napkin or a scrap of paper from the recycle bin. My words will cover every bit. It is the writing that matters. I do not like the pressure of my new, pretty book. The best ideas don’t just happen – it takes some dogged determination and supporters to make them work! Authors for Altruism is one such example. For the past couple of years, Rick Lauber and I have spearheaded this unique community fundraiser. Based on our previous success and growth, we are very pleased to announce the details for Authors for Altruism – Our Third Annual Charity Book Sale and Community Fundraiser and are very thrilled to have silent auction items donated by a senior literary agent, a local publisher and editor, as well as an indoor rock wall climbing centre. If you are a writer or author who has been trying to get your work in front of an agent or publisher, here is your chance! Attend the Third Annual Authors for Altruism Charity Book Sale and Community Fundraiser on Saturday, August 15th, 2015 at Audreys Books (10702 – Jasper Ave., Edmonton, AB) from noon – 3:00 p.m. and bid on one of our amazing opportunities. Every visitor can also enter to win our “Be A Celebrity for a Day” Door Prize. The winner will walk away with items with a retail value of $200, and a priceless chance to go behind the scenes at CORUS Entertainment Edmonton. Shop for books and toys, bid on silent auction items, and help out our very worthy cause. $1.00 from each of the featured author’s book(s) sold (and all proceeds from an accompanying silent auction) to be donated directly to 630 CHED Santas Anonymous. Guest post by Erinne Sevigny Adachi. Keep your reader engaged by ensuring character motivations are believable and align with their background, the plot, and the world you’ve created. When I talk about motivation, I am talking about the WHY. The REASONS. When your character chooses to act (or not act) a certain way, why are they doing (or not doing) so? Does the reason make sense to your story? Could they believably get away with these choices amidst the setting of your book? Believability is, as most things are, subjective. But remember: the fact that you are writing fiction is not trump card. Take a character in a contemporary fiction piece (we’ll call her Andrea) who decides to volunteer at a youth shelter. There she meets a girl who inevitably brings Andrea into a drama that involves a dangerous drug dealer and maybe a teen pregnancy. Sounds like it could be interesting, but let’s examine all the motivations at play here. What is the motivation for the youth shelter to hire Andrea as a volunteer? If it doesn’t make sense for Andrea to be working there, then the whole story is built on a shaky foundation. What is the young girl’s motivation for bringing Andrea into her drama? Andrea needs to provide something to the situation that the youth shelter cannot. Okay, so now what about Andrea’s motivation? Why will she allow herself to be pulled into the potentially dangerous drama? In this case “out of the goodness of her own heart” could work, but if her life ends up in danger, there better be a much stronger reason for her getting involved personally instead of referring the case to the police. Maybe the drug-dealer is a family member she is also trying to protect? Considering the motivations of all the characters in your book is especially helpful at the outlining stage (and don’t even get me started if you’re not outlining your book). Bottom line is that eventually “out of the goodness of her own heart” and other “soft” motivations, while perhaps functional as far as filling a void goes, can quickly become a superficial reason for a story to continue. And if believability is superficial, the reader won’t buy-in to your character’s motivations, nor will they be engaged in your book. Erinne Sevigny Adachi is a freelance editor and publishing consultant. Her business, Blue Pencil Consult, provides manuscript evaluations to writers. For your own manuscript evaluation, you can reach her at esadachi@bluepencilconsult.com.